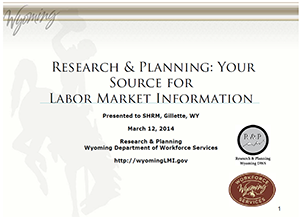 Research & Planning, Wyoming Department of Workforce Services. 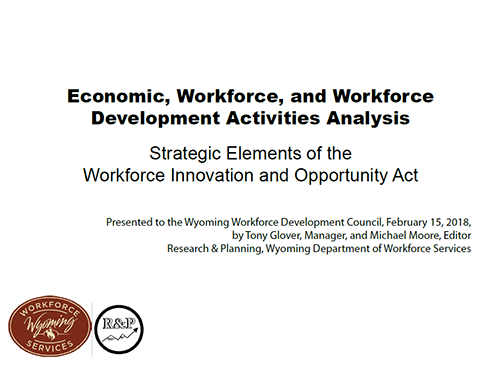 Presented to the Wyoming Workforce Development Council, February 15, 2018, by Tony Glover, Manager, and Michael Moore, Editor. 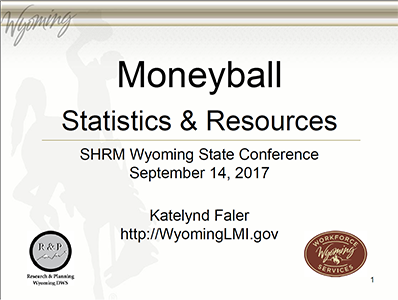 Presented to the Society of Human Resource Management State Conference by Katelynd Faler, Senior Economist, September 14, 2017. 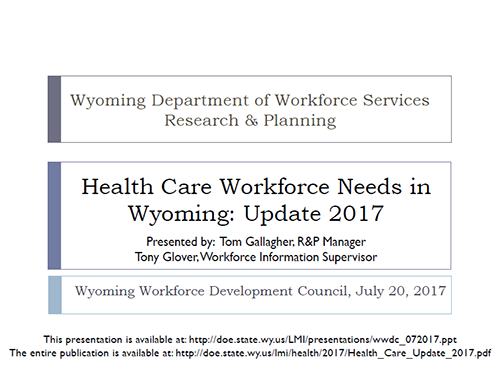 Presented to the Wyoming Workforce Development Council by Tom Gallagher, R&P Manager, and Tony Glover, Workforce Information Supervisor, Thermopolis, Wyo., July 20, 2017. 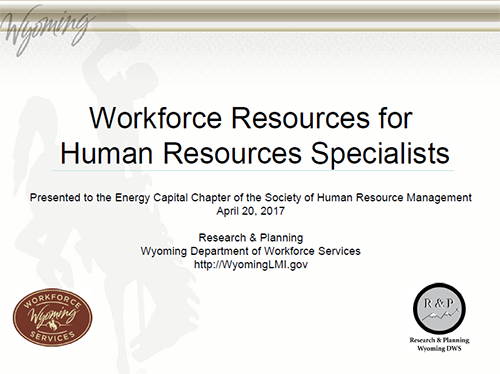 Presented to the Energy Capital Chapter of the Society of Human Resource Management by Katelynd Faler, Senior Economist, April 20, 2017. 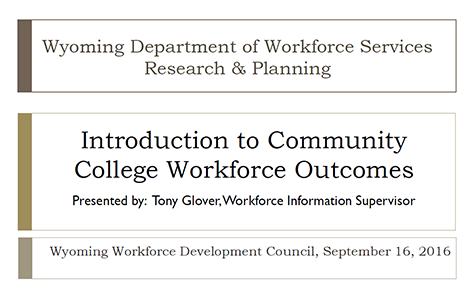 Presented to the Wyoming Workforce Development Council by Tony Glover, Workforce Information Supervisor, Lander, Wyo., September 16, 2016. 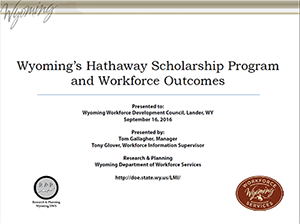 Presented to the Wyoming Workforce Development Council by Tom Gallagher, Manager, and Tony Glover, Workforce Information Supervisor, Lander, Wyo., September 16, 2016. 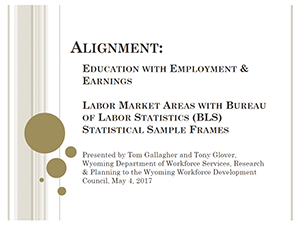 Presented to the Wyoming Joint Education Interim Committee by Tom Gallagher, Manager, and Tony Glover, Workforce Information Supervisor, Casper, Wyo., June 13, 2016. More about the AUBER 2015 Fall Conference is available here. 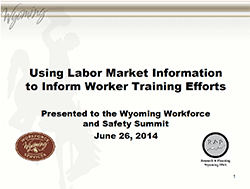 Presented By Tom Gallagher, Tony Glover, and Michele Holmes to the Wyoming Workforce & Safety Summit, June 24, 2015, Cheyenne, Wyo. 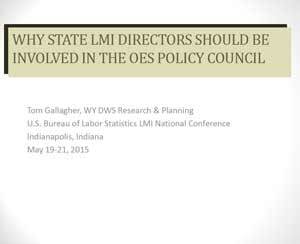 Presented to the U.S. Bureau of Labor Statistics LMI National Conference, May 19-21, 2015, in Indianapolis, IN. 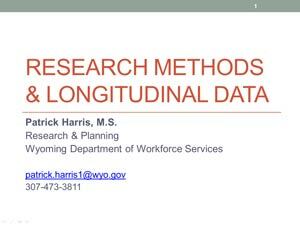 Presented by Patrick Harris, Research & Planning. PowerPoint files, updated December 2014. 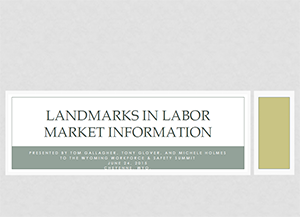 To hear the audio portion of these presentations, view them in Slide Show mode. 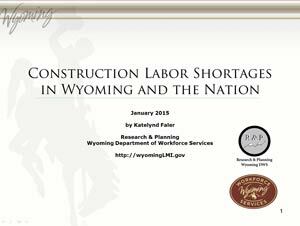 A summary presentation of the white paper “Construction Labor Shortages in Wyoming and the Nation,” by Katelynd Faler, published by Research & Planning in January 2015. To hear the audio portion of this presentation, view it in Slide Show mode. 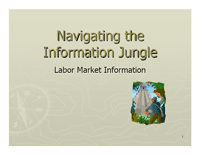 Can High School Students Use Labor Market Information to Make Informed Career Choices? 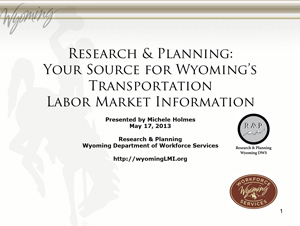 High school students from Star Lane Center in the Natrona County School District (NCSD) were shown how to access occupational projections, wages, and other data provided by the Research & Planning (R&P) section of the Wyoming Department of Workforce Services. 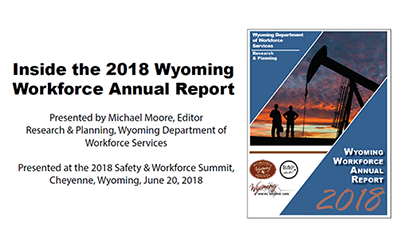 The students were tasked with analyzing their chosen career paths and presenting their findings to the Wyoming Workforce Development Council (WWDC). The project required students to use occupational projections and wage information to analyze their chosen career paths in terms of the education required for the career and the potential for earnings once employed. Students were also asked to assess some of the vocational training opportunities proposed by NCSD’s forthcoming Center for Advanced and Professional Studies program. 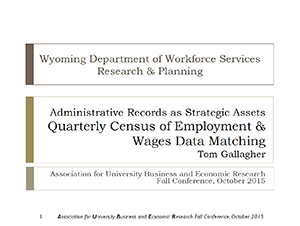 Students were given access to occupational wages, projections, and other R&P data in order to complete the project. 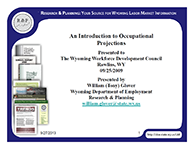 Occupational wages and projections information used by the students can be found at http://doe.state.wy.us/LMI/projections.htm. Presentation created by Star Lane students Katalin Gonzales, Alex Glover, Melissa Shoemaker, Logan Fox, Isaac Lee, Kellie Reynolds, Adam Couldridge, and Elias Vlastos. 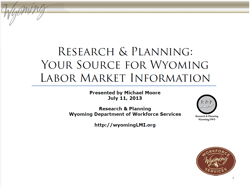 Presented by Michael Moore at the Wyoming Department of Workforce Services' Employer Information Seminar in Rawlins, WY, on July 11, 2013. 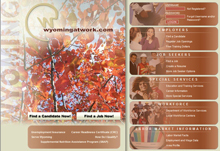 Wyoming Labor Market Information – There's a Website for That! 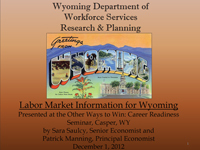 Presented by Sara Saulcy, Senior Economist Wyoming Department of Workforce Services Research & Planning Section June 15, 2012, at the Governor's Workforce Summit on Workforce Solutions in Gillette, Wyo. Presented February 16, 2012, to the Casper Kiwanis Club, Casper, WY. 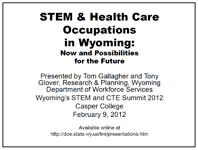 Presented by Tom Gallagher and Tony Glover at Wyoming's STEM and CTE Summit 2012, Casper, WY, February 9, 2012. 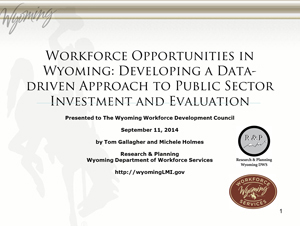 Presented by Doug Leonard at the White House Business Council Roundtable, Casper, WY, June 24, 2011. How Do We Establish Need? 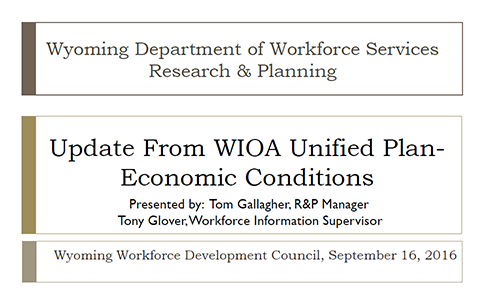 Presented by Tom Gallagher and Tony Glover at the Healthcare Workforce Summit in Cheyenne, Wyo., on June 14, 2011. Presented by Tom Gallagher at the Researching the Green Economy Conference in Des Moines, Iowa, on April 19, 2011. 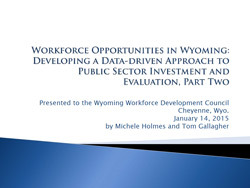 Presented by Tom Gallagher at the Wyoming Health Care Workforce Summit in Cheyenne on January 19, 2011. Presented by Tom Gallagher at the Wyoming Business Report's Central Wyoming Economic Forecast Luncheon on November 30, 2010, in Casper. Presented by Douglas W. Leonard, Principal Economist, to the 2010 Governor's Summit on Workforce Solutions, Casper, WY, on June 17, 2010. 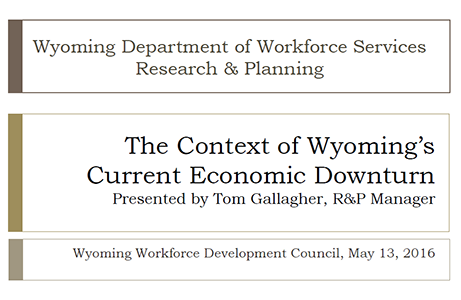 Presented at The Greening of LMI Forum, Denver, Colo., on May 6, 2010, by Tom Gallagher, R&P Manager; William (Tony) Glover, Workforce Information Supervisor; and Doug Leonard, Principal Economist. 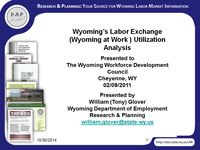 Presented to the Wyoming Auctioneers' Association, 15th Annual Convention, January 22, 2010, by Doug Leonard, Principal Economist. Presented by Deana Hauf, Economist, at Research & Planning, January 15, 2010. 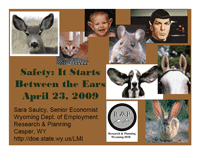 Presented by Sara Saulcy, Senior Economist, at the 2009 Wyoming Workers' Safety Awards Conference, April 23, 2009, in Casper, Wyo. 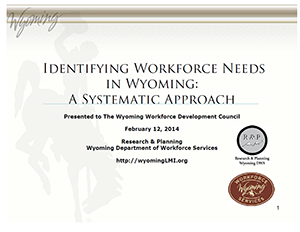 Presented at the Wyoming Department of Employment Employer Information Seminar, December 3, 2008, in Cheyenne, Wyo. Presented to Wyoming Medical Center on June 17, 2008, in Casper by Tom Gallagher, Manager. 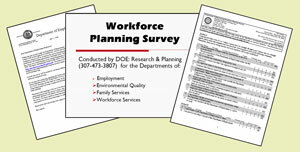 Presented to the Nurse Advisory Committee Meeting on May 19, 2008, in Casper by Tom Gallagher, Manager. 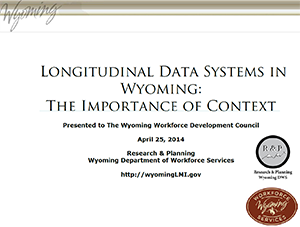 Presented to the Wyoming Planning Association at Douglas, Wyo., on Sept. 13, 2007.